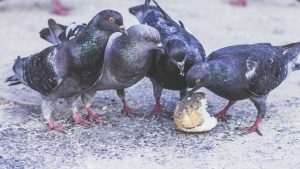 Unfortunately, there are numerous human pathogens associated with pigeons, these include those that can be dangerous or even deadly. Therefore pigeon infestations can provide a serious health risk. In previous studies, 60 different microorganisms were associated with feral pigeons and these were capable of causing human disease. Fungi accounts for the majority of microorganisms that were found. 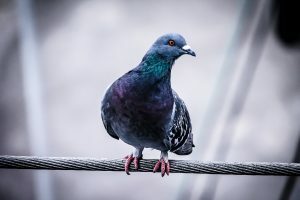 Whilst it would be true to say that pigeons pose a much lower health risk from disease transmission in comparison with rodents or flies the risk still remains. Significant risks arise where large and long-standing pigeon roots are present. Histoplasmosis and Crytococcosis may be found growing in and under bird droppings. Both of these disease organisms cause respiratory disease and can produce deadly infections. In addition allergenic hypersensitivity pneumonitis a disabling lung disease can result from a reaction to airborne debris from bird feathers and droppings. There is a lesser-known but also dangerous health threat associated with bird roosts. Allergenic hypersensitivity pneumonitis is a potentially disabling lung disease, not caused by an infectious agent, but by an allergic reaction to airborne debris from bird feathers, droppings, and other bird proteins. Experts estimate that from one to five percent of individuals exposed to bird proteins (antigens) will develop symptoms. Where a person has a depressed immune system they can be particularly susceptible to some of the human pathogens which are carried by pigeons. Therefore it would be unwise not to control flocks of pigeons which form to hospitals, nursing homes, medical clinics and other sites of a similar nature. The control of birds and associated bird proofing needs to be carried out by suitably trained Pest Prevention Technicians. Often working at height this work can be dangerous and involves a high degree of Health & Safety and the knowledge that comes from being fully trained to BPCA standards. Contact us today for help with professional pigeon prevention. Pigeon proofing is a form of pest prevention to a building to prevent roosting. Excluding pigeons from a building by the use of netting under canopies, to the front fascias of buildings for instance. Where it may be difficult to net the use of spikes on plastic strips, spiking at different angles can form an obstruction in order that the pigeons will not land but fly off. In addition, bird gel ( which gives the impression to the pigeon that a building is on fire) can be extremely effective. Unfortunately, pigeons will often become comfortable with certain pest prevention methods such as the use of plastic owls, hawks, balloons or flying hawks. Please visit our bird proofing page for more information on how we can help.